Erin is going to take this movie WAY too seriously, so I'm offering a rebuttal. It isn't good, of course it isn't good. It's a CG Barbie movie. But it's not crime-against-humanity levels. It's pink and girly and very G-rated. They gender swap all the characters (which is more than fine with me) and make the story more about the sin of vanity than the sin of greed. Frankly, except for a few particularly painful scenes, I'd put this squarely into “so-bad-it's-good”. Not quite good enough to seek out, but pair it with Beauty and The Beast: Enchanted Christmas, some sort of pink champagne, and a room full of enthusiastic young women, and you might have a very amusing time. I mean. 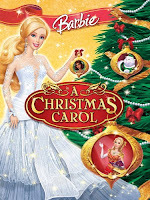 it's produced by Mattel Entertainment! HA! The DVD has a sing-along mode. The main character has a fat tag-a-long cat named after a different Dickens book. The Ghost of Christmas Past is a completely manic Tinkerbell. The whole thing is nuts. I saw this about eight years ago on Cartoon Network, and I never forgot it. When we were listing specials we had to track down, this was high on my list. Very high, in fact. Why? Is it good? 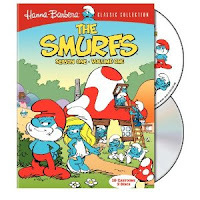 Of course not: little - if anything - about the Smurfs is deserving of that title. No, it's not good. But I'll be damned if it isn't gloriously and hilariously bad. This is one of those specials you need to see to believe. You see, it's Christmastime in Smurf village, some kids are lost when their sleigh overturns, and Gargamel is up to his old tricks. Then the devil shows up. Oh, they never call him that, and he doesn't look like the devil: he looks like a Snidely Whiplash in a cape. But he's the devil, complete with infernal power, contracts, and rules limiting his actions. And he's kind of scary. Growing up, I always hated He-Man. Everything about the show repulsed me; I'm not entirely sure why. I certainly liked other bad cartoons, but something about He-Man just felt wrong. Well, I'm older now, and am no longer disturbed by the program. Actually, I really enjoyed the 2002 reboot. Sorry - I'm getting off topic. 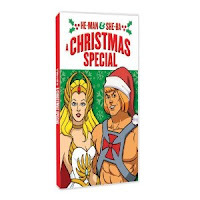 The point is, The He-Man & She-Ra Christmas Special wasn't part of my childhood. The first time I saw it was at a Christmas party a few years back. The second was last night on Hulu. Placed firmly in the "so bad it's good camp," I have to admit this is really entertaining. I mean, yeah, it's awful. Really, really awful. But it's also hilarious. The story - to the extent the term applies - follows the misadventures of Orco, as he accidentally teleports a few children from Earth to Eternia. The kids tell everyone about Christmas, which pisses off Horde-Prime, who seems to be the overlord of an evil empire. This was a very confused movie. I'm not saying that just because I got a little tipsy before watching it, but you may want to keep that fact in mind. The first five minutes are insipid crap, and then the action moves to Mars and I started to... enjoy the movie! The premise is, the kids of Mars are addicted to Earth TV, and they are depressed and not eating. The leader of the Martians calls up his deputies and seeks the advice of the Ancient One. The Ancient One tells him the kids are sick because with the Martian advanced learning technology, the kids learn how to be adults too fast, and never learn to have fun. He recommends seeking the specialist in childhood joy: Santa Claus. 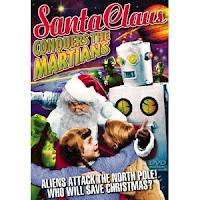 And so the Martians set off to capture Santa. As is often the case, the "Frosty the Snowman" DVD we took out of the library came with a second feature attached. 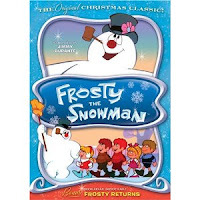 "Frosty Returns" is one of the most bizarre specials I've seen in some time. It's highly uneven, containing some brilliant humor interspersed with some of the most awful songs ever composed for a Christmas special (I'll let that sink in for a minute). Even worse is the narrator, a sort of cross between a lumberjack and pixie who appears at the start and end of the special riding on a snowflake. This thing would make Mr. Mxyzptlk cringe.